Many other actors have had their careers fade or completely fall off. Oftentimes, it’s one movie that can do it. 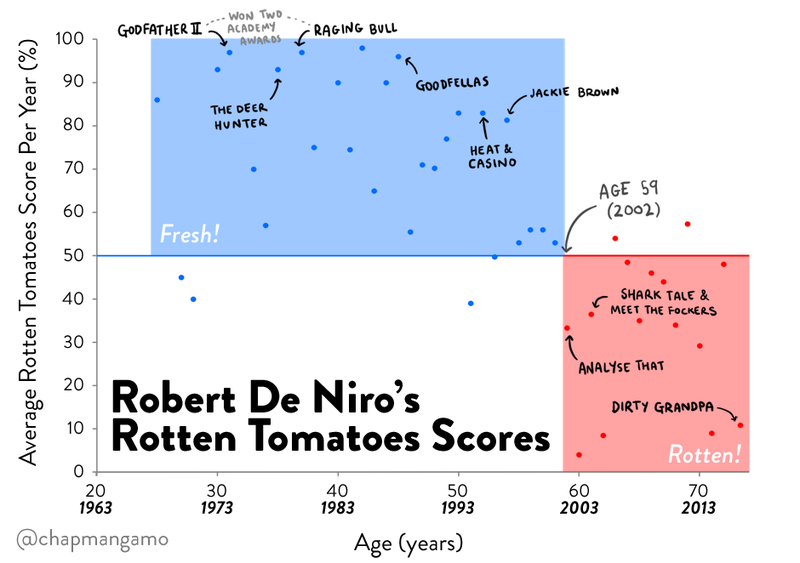 I wanted to visualize this data for other actors who’ve experienced career declines and see if they, like Robert De Niro, where they just stopped caring or ran out of luck. I combed through a ton of posts about what actors no one cares about. I didn’t always agree with these them but some big names kept popping up. 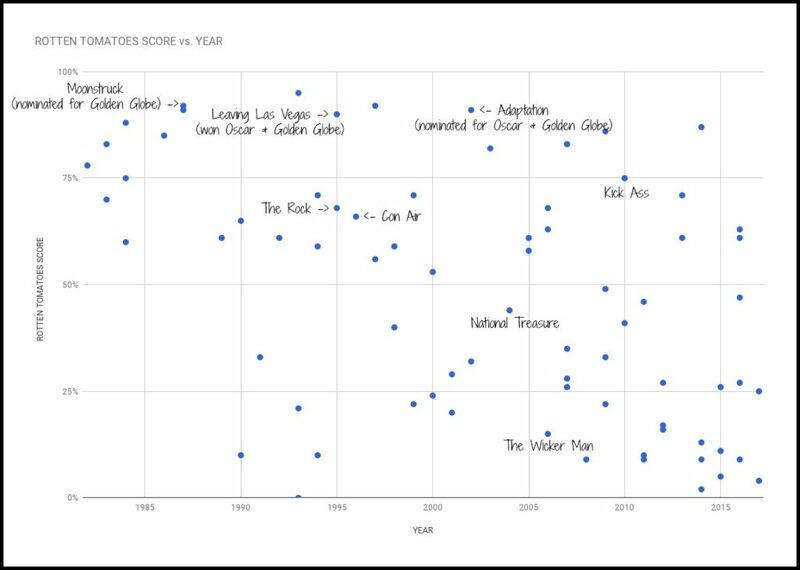 I will show their films chronologically, with the respective Tomatoes Scores. These charts only includes films (no TV shows) that they have acted and excludes those where they have only served as director or producer. Documentaries and cameos have been excluded. Born Nicolas Kim Coppola on January 7, 1964 in Long Beach, CA. 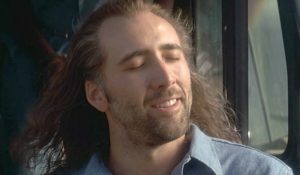 Cage had a fairly strong career up until 2005. 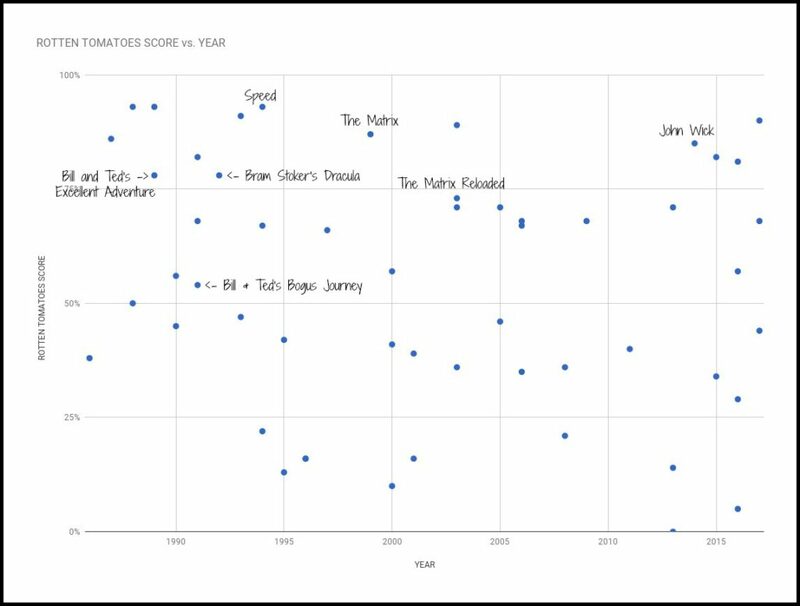 Since then he has been in several decent films but this number is minimized by the number of bad films. Cage has been in financial trouble since 2009 due to owing back taxes and overspending. Lately, it seems like he’s been taking as many roles as he can for the paycheck. Born Edward Regan Murphy on April 3, 1961 in Brooklyn, NY. 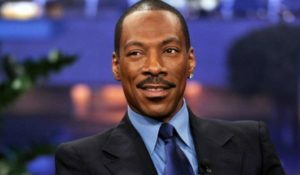 Eddie Murphy started off his career strong but made a lot of bad movies in the 90s and early 2000s. His career picked up a bit with hits like Shrek, Shrek 2, and Dreamgirls. But he just hasn’t making that many films as of lately. Born John Joseph Travolta on February 18, 1954 in Englewood, New Jersey. 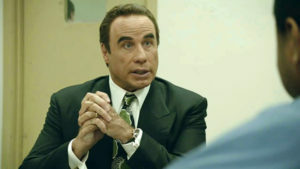 Like Eddie Murphy, Travolta’s career started strong but started to really falter in 2000 after the poorly received (and Scientology inspired Battlefield Earth. Since then his bad movie to good movie ratio has been really uneven (in favor of bad). 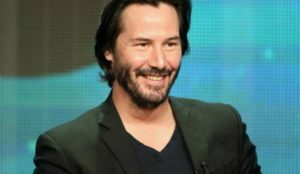 Born Keanu Charles Reeves on September 2, 1964 in Beirut, Lebanon. 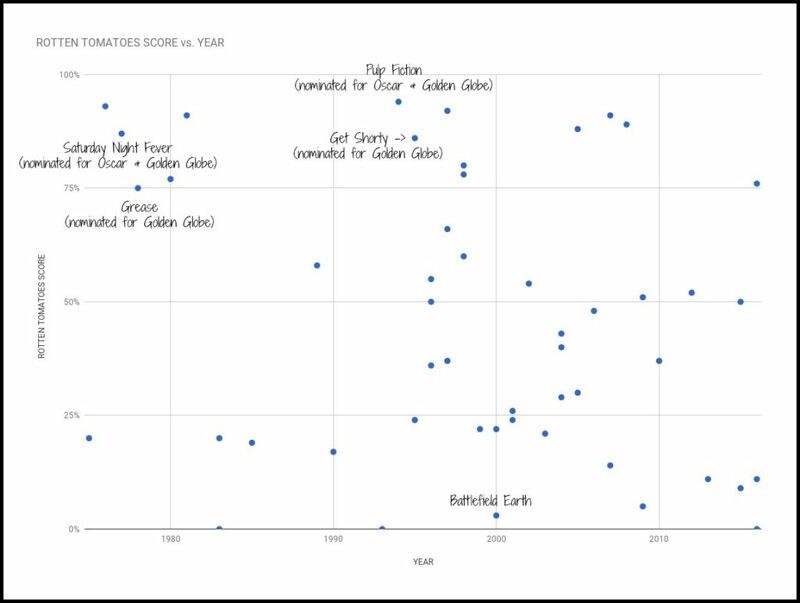 Reeves started out his career with a number of hits but his career seemed to loose steam by 2005. 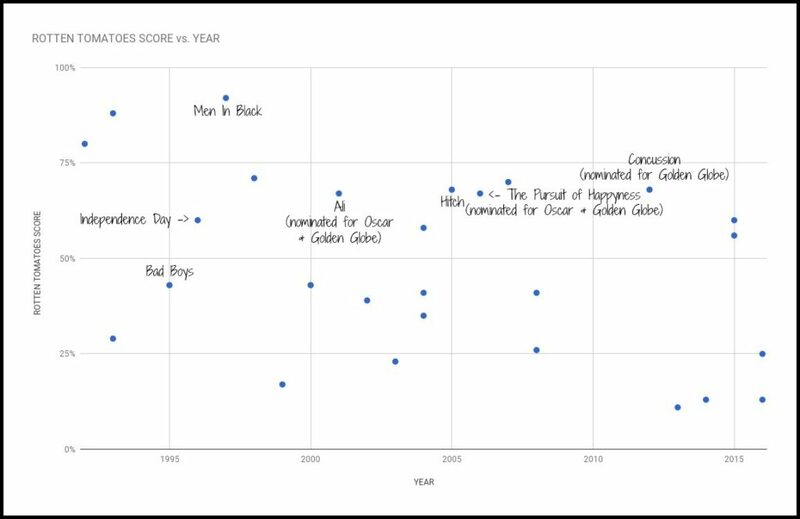 But since 2013, he has been in a fairly even amount of good and bad films. 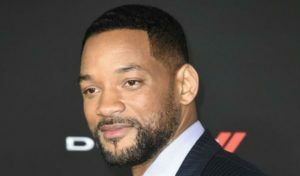 Born Willard Carroll Smith Jr. on September 25, 1968 in Philadelphia, PA.
Smith’s career has been reasonably balanced between good and sub-par movies. 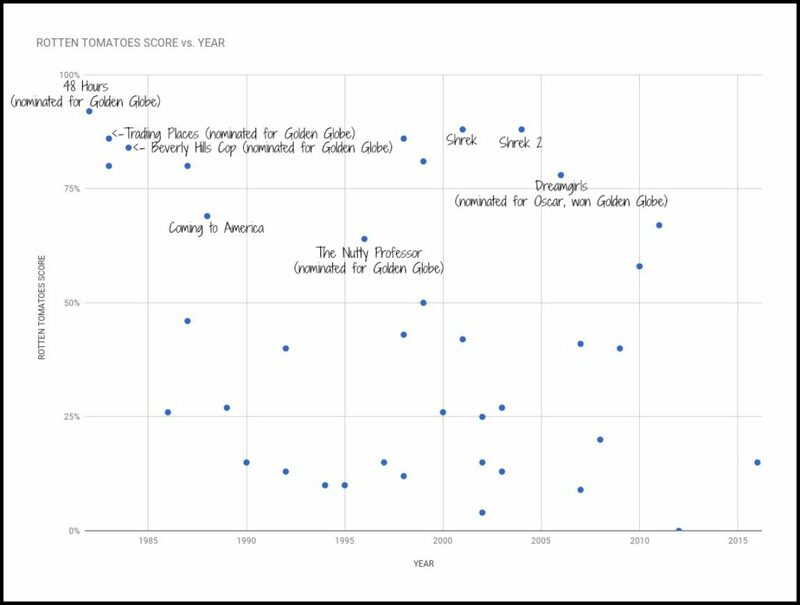 But since 2010, his movies, in general, haven’t been as well received as his previous work, with many of them being poorly received.